Following today’s pricing announcement, we are happy to announce the general availability of SendGrid’s new Customer Portal. 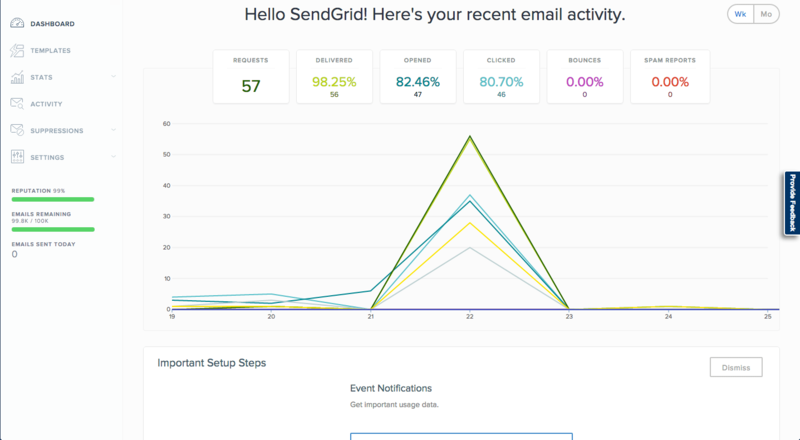 With today’s launch, we’ve reinvented the way that our customers interact with SendGrid. Whether it be through our innovative and seamless interface, or our new, robust Web API, our customers will experience the new SendGrid Customer Portal as the most intuitive and flexible way to engage with their customers through email. The first thing our customers will notice when logging into their account is a sleek, new interface. Designed with a focus on usability and easy navigation, the new Customer Portal was built with flexibility as a priority, enabling our customers to create, send, and analyze their communications within the (wizardless) workflow that works best for their team. But, it’s not just a pretty face. Over the past year, we’ve worked alongside our customers (enterprise, startups, developers, and marketers alike) and learned firsthand from their needs and pains. This new Customer Portal was built intentionally with an uber-flexible backend for developers, and a beautiful and intuitive interface for non-technical users. Under the hood, we’ve completely rebuilt our Web API and made it the backbone of the Customer Portal. The interface itself is built on the same Web API our customers use so that the entire functionality is easily programmable. We’ve packed this new Customer Portal with new features and enhancements. In beta since last fall, our unsubscribe groups feature emerges into general availability today. With unsubscribe groups, our customers can enable their recipients to manage their email preferences—allowing them to unsubscribe from emails by group instead of a global suppression from all sends. Perhaps most exciting from our product team’s perspective, is the release of our completely reworked whitelabel management features. We started over from scratch, decoupling our link, IP, and domain whitelabeling to enable for more flexibility and transparency. We are also proud to introduce automated security into our domain whitelabeling. We now create a custom SPF and DKIM record that we manage and hand directly to the ESP—securing the email more than ever and making it impossible to be spoofed. With this new security in place, simply set your automated whitelabel domain records once and never worry about your DKIM or SPF records again. Those are just a few of the exciting features included in this release. We launched the new Customer Portal in beta back in September, and have received a terrific response from our beta testers. We’re now happy to say that the service is out of beta and generally available, visible immediately upon logging into a SendGrid account. We’re excited to bring this new Customer Portal to our users and hope you like the improvements and new features. This is just the start of more updates to come. Log into your SendGrid account to see the update and check out our new documentation for more details. On the Product Marketing team at SendGrid, Cassie is inspired by her frequent conversations with developers and marketers, all of which help to influence the SendGrid product direction as well as how we communicate and deliver our products.